BBQ Fish – or Ikan Panggang is a general term meaning grilled or barbecued fish. A popular local fish for grilling is Ikan Kembong. Marinated with dollops of spice paste, the fish is wrapped in banana leaves and grilled to perfection over charcoal fire. 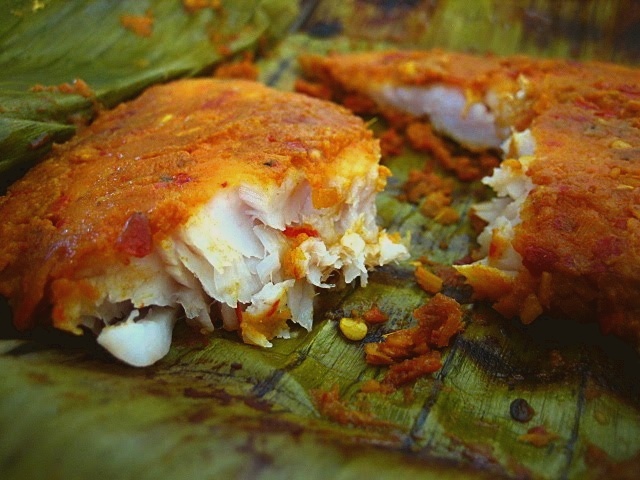 A true Malay classic, ikan panggang/ikan bakar (grilled fish wrapped in banana leaves) is very popular in Singapore. Using a food processor, blend the spice paste. Clean the fish and pat dry. Coat the fish with the spice paste evenly and wrap it with banana leaves. Use toothpicks to hold the banana leaves so the fish is wrapped tightly. Leave the parcel in the refrigerator and marinate overnight. In a mortar and pestle or food processor, pound/blend the red chilies, bird’s eye chilies, and toasted belacan. Add tamarind juice and sliced shallots to the sambal. Stir well. Heat up your grill and grill the fish parcel for 5 minutes on each site (or until the banana leaves are burnt). Serve hot with the sambal condiment.